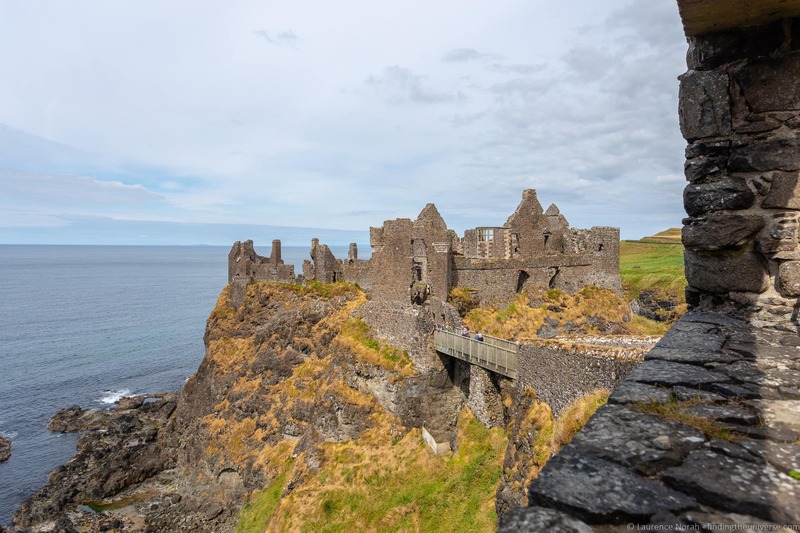 Running for almost two hundred miles along the coast from Belfast to Londonderry (Derry), this Northern Ireland road trip has everything from castles to stunning landscapes, Game of Thrones filming locations, whiskey distilleries, sandy beaches, and UNESCO world heritage sites. Today, we’re going to take you on a tour of some of our highlights of the Causeway Coastal Route, as well as answer some questions you might have about driving the route. Let’s get started with the highlights. Can I See the Causeway Coastal Route Without a Car? How Long Does it take to drive the Causeway Coastal Route? When is the best time of year to visit Northern Ireland? For this post we’re ordering our highlights from leaving Belfast (southeast endpoint of the route) and then running in order west around the coast all the way to Londonderry, where the causeway coastal route ends. We’d suggest perhaps starting your Northern Ireland in Belfast, where you could get inspiration from our 2 day Belfast itinerary, before setting out on this road trip. Just a short drive from Belfast, the town of Carrickfergus was for a time the largest city in the area, holding an important position on the water. The town, which dates from the Middle Ages, was walled for defensive purposes, with the main defensive structure being Carrickfergus Castle. The castle was built in 1177, and is the best preserved Norman-style castle in Ireland. It’s also open to the public, and is a very impressive castle to visit. The highlight for us was the impressive central keep, which is the oldest part of the castle, surrounded by no less than two major defensive walls. 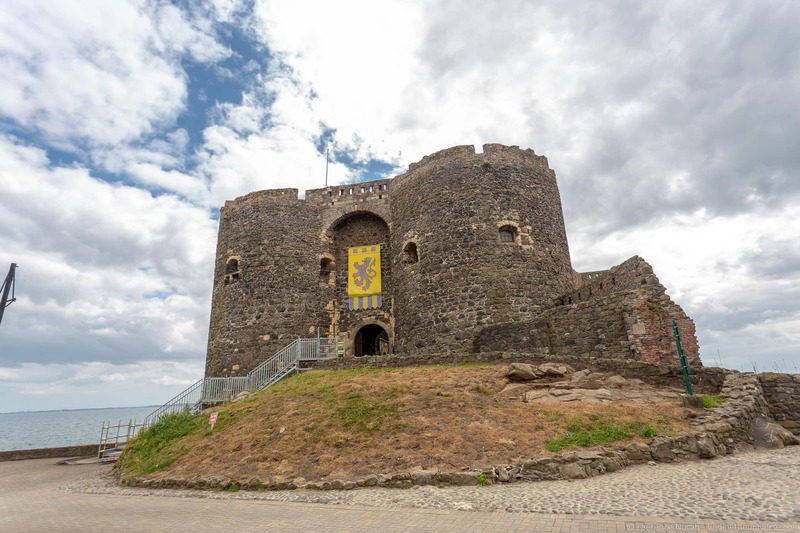 You can wander the keep up to roof level, get lost finding your way to the walls, take in the views across the bay and back over Carrickfergus town, and learn all about the history of the castle, it occupants and the various battles that took place here. There’s a very informative on-site visitor information centre, plus you can take guided walks of the castle as well, which are included as part of the entry price. We’d also advise taking a bit of time to wander around Carrickfergus itself, there’s an excellent free museum about the history of the city, some nice churches, and you can also see a few remaining parts of the old city wall. Our next highlight along the Causeway Coastal Route is “The Gobbins“, which is a great name for a wonderful place. The Gobbins is a dramatic cliff-face path that takes you right along the waters edge of some of Northern Ireland’s most spectacular coastal scenery. Along the path, you’ll see bridges, caves, scenic views, and local flora and fauna. You have a good change to see sealife and birdlife, and if the weather is clear, you may get views across to Scotland. The attraction is also of note for its historical importance. It was built in the Edwardian times by a railway engineer, and opened to visitors in 1902. It rapidly became a must-see attraction as a day trip from Belfast, attracting crowds of people who each paid a small fee to visit. Over time, the challenging combination of bad weather and coastal erosion led to the path, which consisted of iron bridges, steps and chains, becoming badly in need of maintenance. Unfortunately, the cost was prohibitive, and the path was closed to the public in 1954. All was not lost though! 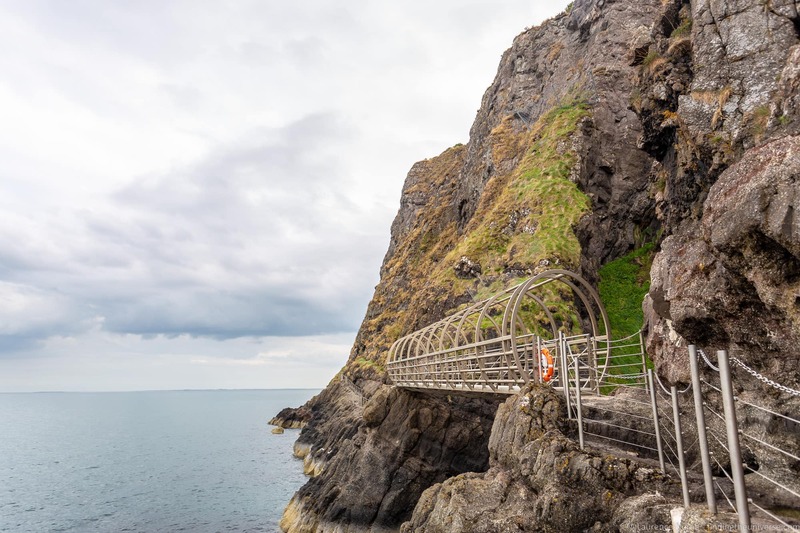 In 2014, following decades of efforts to restore the Gobbins, and a concerted effort to reconstruct the path and its bridges that commenced in 2011, the path re-opened as a guided walk experience. From then it has gone from strength to strength, with thousands of visitors making the 2.5 hour hike each day. To do the hike, you need to book a tour in advance. Tours have to be booked through The Gobbins visitor centre, and we highly recommend you book your tour well in advance as this is a popular attraction. All visits start from the visitor centre. It’s also not open year round, and rock falls and coastal erosion continue to be a problem, so parts of the path can be closed at short notice. It’s certainly a unique experience though, and one we can highly recommend! If you prefer your castles to be a bit more romantic looking, with landscaped gardens in place of defensive battlements, then we can recommend a stop at Glenarm Castle. Glenarm Castle is one of the oldest estates in Ireland, and is the ancestral home to the Earls of Antrim. It was built in 1636, and is a beautiful castle that looks like a large country home. 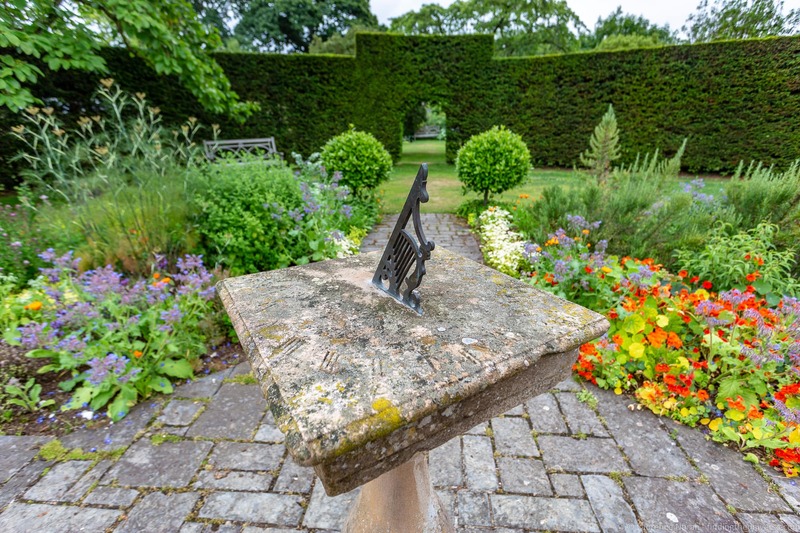 One of the highlights of a visit here is a trip to the walled garden, often referred to as the most beautiful in Britain. Visitors can also follow the castle trail, for views of the castle and grounds. Even on a grey day like we had, the gardens still look beautiful. The castle is still the full time residence of the MacDonnell family, so is not usually open for tours. However, on certain dates it does open it doors to visitors, who are shown around the property by guides. See the official website for castle opening times if this is of interest. 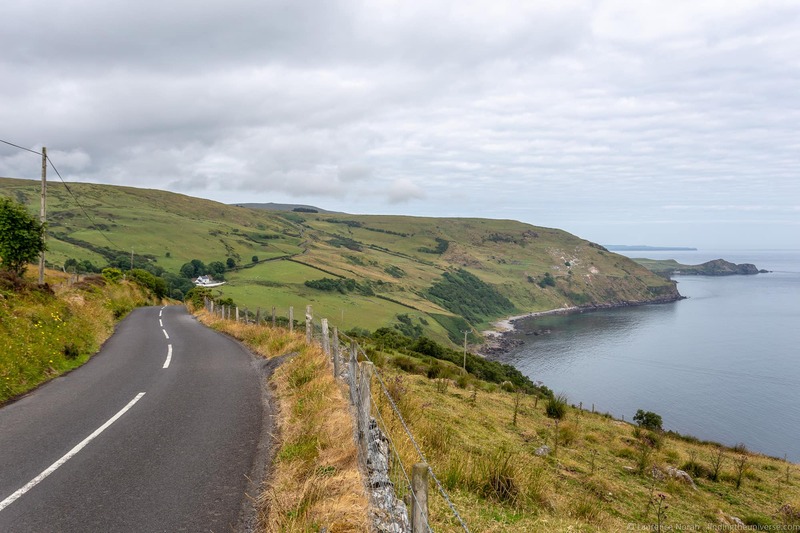 The Causeway Coastal route is first and foremost a road trip, and one of the most impressive sections to drive is the largely single-track road out to Torr Head. This is a bit of a detour from the official route, but as it takes you closer to the coast itself, we think its a detour that is well worth making, as long as you’re driving a normally sized car – this road isn’t going to fit a campervan or similar sized vehicle very easily! So we’d definitely recommend avoiding if in a larger vehicle and sticking to the signed route. 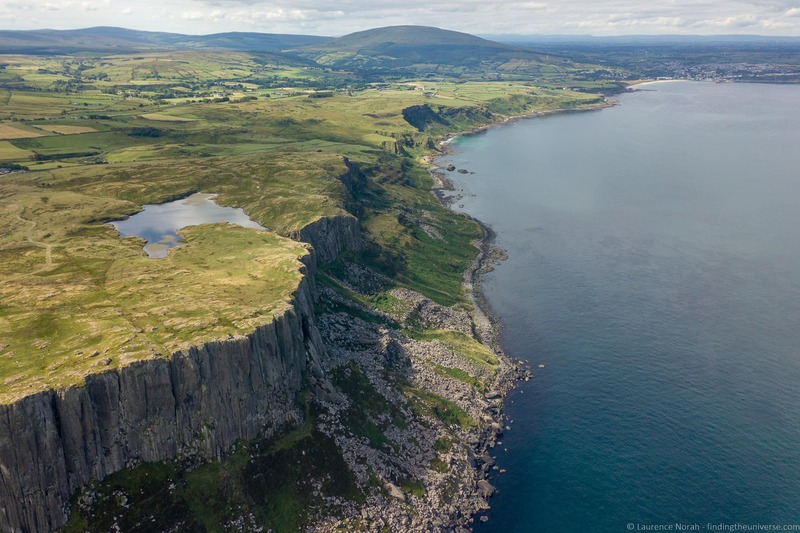 The Torr Scenic Route, as the road is officially referred to, leaves the main causeway coastal route at Ballyvoy, and then winds magnificently along the rugged coastline to Torr Head itself. 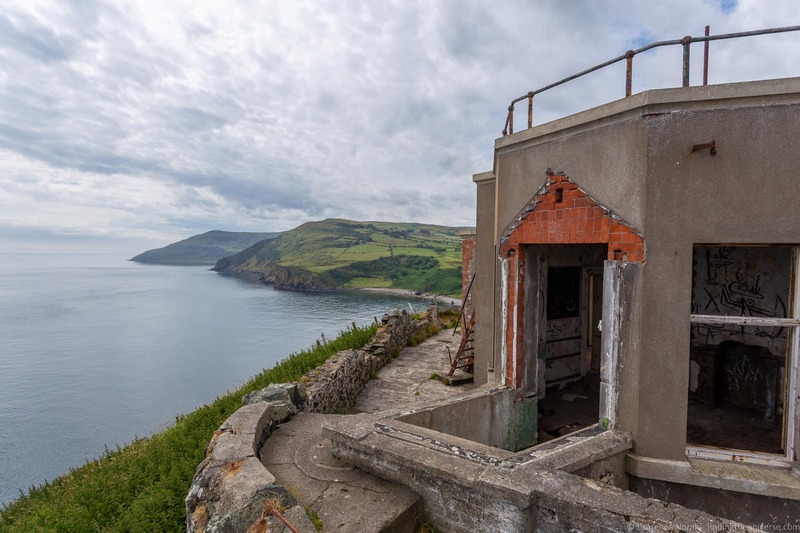 This is home to a beautiful bay, as well as a lookout building, which used to be where transatlantic shipping was monitored from. We very much enjoyed this route – the views were beautiful, and the short hike up to the top of Torr Head was a nice opportunity to stretch our legs and get a look at the incredible coastline here. If you don’t mind driving on winding narrow roads, this detour is definitely one to add to your to-do list. 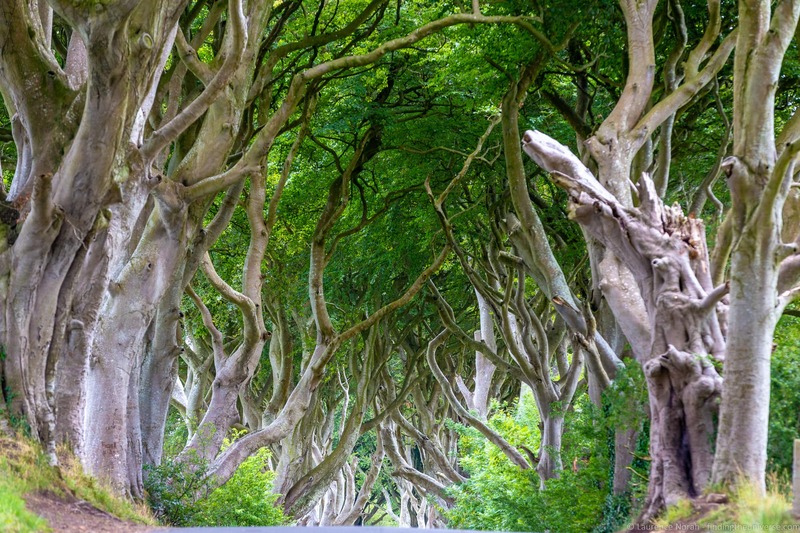 Ok, the Dark Hedges are not strictly on the Causeway Coastal Route, but this avenue of trees has become world famous thanks to being featured in the Game of Thrones TV show, so we felt it would be remiss of us to leave it out! The Dark Hedges is a beautiful avenue of beech trees that were planted in the late 18th century, originally to form a “living” alleyway to the gates of nearby Gracehill House (now an events venue and golf course). For centuries these trees grew to become ever more magnificent, with their winding trunks and branches forming a fantastical tree tunnel, just over half a mile in length. Naturally, such a beautiful location was eventually going to be featured in some kind of TV show or movie, and the Dark Hedges has appeared in both, with Game of Thrones being the most well known show to be shot here. For more information on visiting, including parking information, tips for avoiding the crowds, and getting the best photos, see our detailed guide to visiting the Dark Hedges. 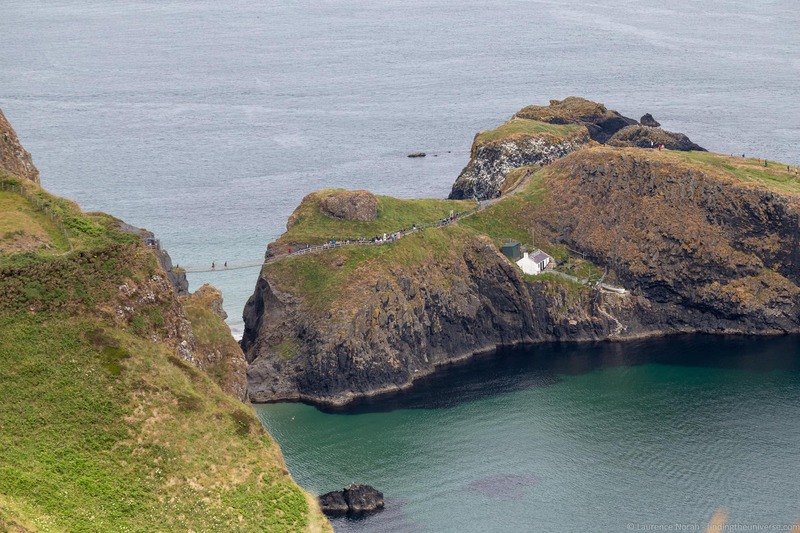 Back to the coast, and another popular stopping point for visitors on the Causeway Coastal Route is the Carrick-a-Rede rope bridge, which is managed by the National Trust. The rope bridge is the key attraction at this coastal hike, which winds along this beautiful part of the coastline. I know I keep saying how beautiful this coastline is, trust me, you will appreciate my sentiments when you visit! The rope bridge connects Northern Ireland to the tiny island of Carrickarede. Local salmon fishermen created the first version of the bridge over 350 years ago to gain access o the island, which they used for fishing, although there are now very few salmon in the area and as such fishing no longer takes place here. Instead, people come here primarily to walk across the rope bridge to the island. In the centuries since the first bridge, the rope bridge has taken many forms. Early iterations were truly terrifying constructions which spanned across the 20 metre gap, featuring planks, rope, and not much in the way of handholds or safety features. Thankfully, today’s iteration is a far safer affair, although many still balk at crossing – seeing the rocks and water crashing thirty metres (100 feet) beneath your feet is a fairly scary feeling, especially if you aren’t into heights. The Carrick-a-Rede rope bridge is a popular destination, and to manage the crowds the National Trust runs a timed entry system. Tickets are only sold on site for the same day, with tickets on sale from 9.30am at the site entrance. Advance purchase is not possible (unless you with a tour group). Our suggestion is to come early to get your ticket. There are a number of attractions nearby that you can fill your time with if you have to wait, including the Dark Hedges and then all the attractions below up to Dunluce Castle. Just make sure you come here early enough to get a ticket for the day as there is a maximum capacity each day. If you are travelling with a group or tour, these tickets are booked separately and your tour guide should have arranged this in advance. National Trust members get in for free, but you still need to stop by to get your ticket to reserve a time. You didn’t think we were done with Game of Thrones references did you? 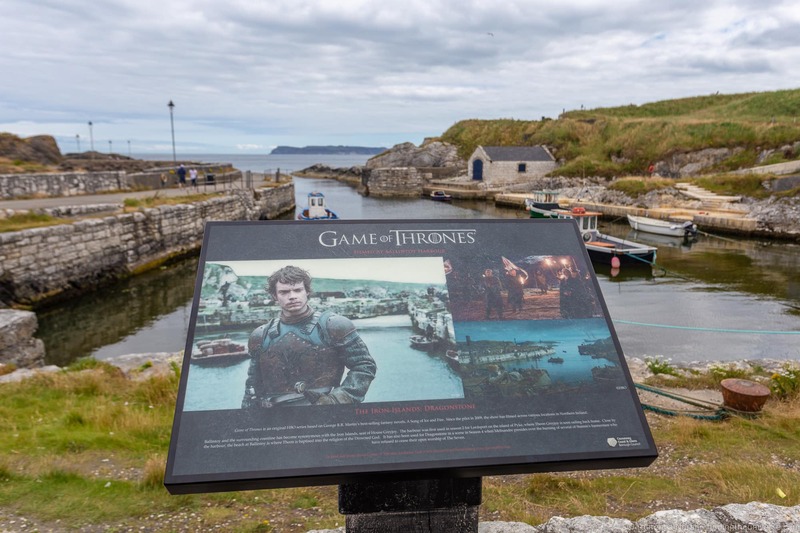 There’s a reason there are whole Game of Thrones focused tours of this part of Northern Ireland – the country was the location of multiple scenes from various seasons of the show. One of the prettiest locations is the cute and historic fishing harbour of Ballintoy, a short drive from Ballintoy town itself. This harbour stood in as the Iron Islands in Game of Thrones, and its not hard to see why the producers chose this location. The harbour doesn’t look to have changed a great deal over the years, and the rock formations here are quite impressive. There’s also a sandy beach, and a large cave you can visit. Game of Thrones fans will also want to visit the Fullterton Arms in Ballintoy. This is home to one of ten Game of Thrones themed carved wooden doors, which were made from one of the Dark Hedges trees that fell in a storm. 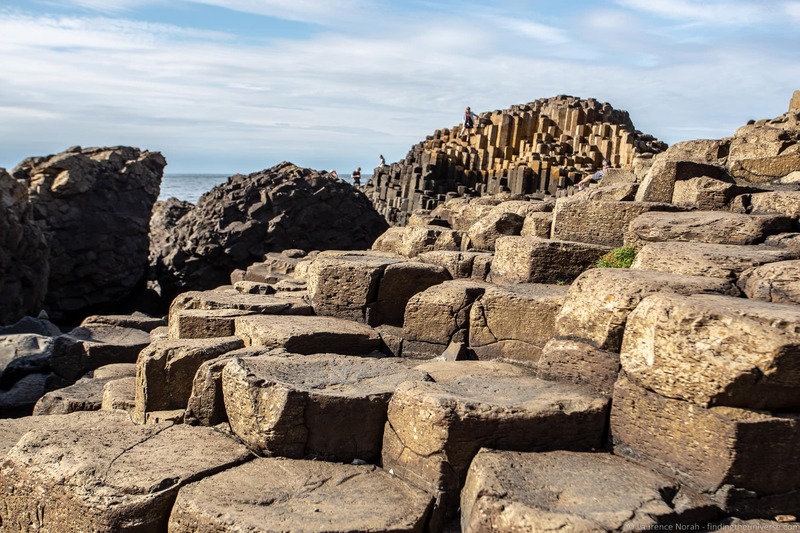 The Giant’s Causeway is one of the most recognisable attractions in Northern Ireland, and is where the coastal route you are journeying along got its name. It’s the only UNESCO world heritage site in Northern Ireland, and is an absolute must-visit when in the country. The Giant’s Causeway is a geological feature, which consists of around 40,000 hexagonal basalt columns that appear to form a staircase-like pathway out to sea. The legend goes that the causeway was built by an Irish giant, so he could do battle with a Scottish giant. The more scientific explanation for the columns is that they were formed by cooling lava around fifty million years ago, with the cooling lava cracking into the formations we see together. Whichever explanation you prefer, it’s hard not to be impressed by the incredible uniform shape and structure of the stone here, which is both photogenic and fun to explore. There’s a large visitor centre which has information on pretty much everything you might need to know about the Giant’s Causeway, from how it formed through to local legends, and the history of tourism here. It’s a great exhibit and definitely worth taking a bit of time to explore. From the visitor centre, you can either take the shuttle bus (fee applies, free for National Trust members), or walk down to the causeway, which is around a fifteen minute stroll. Most visits are self-guided and you can use the audioguide to help direct your visit, but you can also join a guided tour if one is running during your visit. Note that whilst it’s technically free to visit the Giant’s Causeway, a fee applies for use of any of the on-site services, including parking, the museum and exhibits, and bus. We think it’s a fee that is well worth paying, as it also includes informative audio guides, and we’ve done it on both of our visits. All these services are free for National Trust members. If you are planning on visiting both the Giant’s Causeway and Carrick-a-Rede rope bridge, you might consider investing in a National Trust Touring Pass. This will give you free access to both these attractions, as well as many other National trust properties across Northern Ireland and the UK. 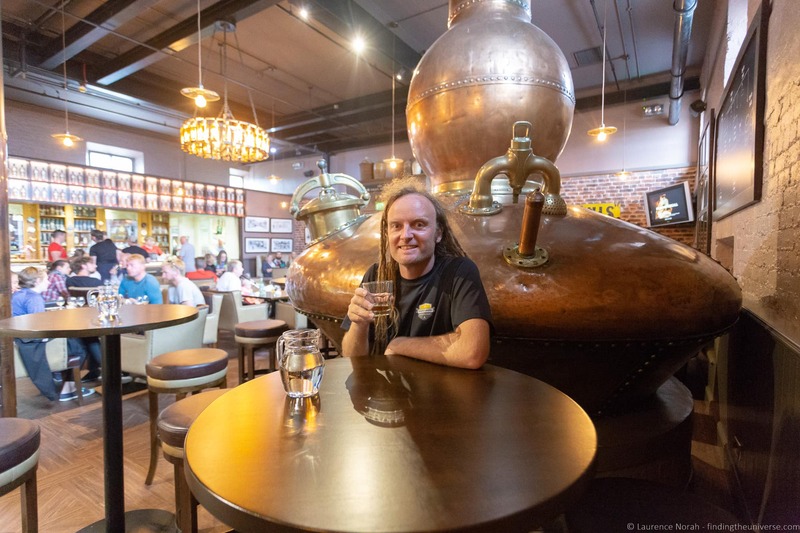 Fans of Irish Whiskey will definitely want to make a stop at the old Bushmills Distillery when driving the Causeway Coastal Route. This is Ireland’s oldest licensed distillery, with the first license to distil whiskey on this site granted in 1608! Bushmills itself wasn’t actually established until 1784 however, although the 1608 date is printed on the bottles in reference to the original license date. Today, Bushmills is one of Ireland’s best selling Irish whiskey brands, with both blended and single malt whiskeys available. All their whiskey is produced on the Bushmills Distillery site using water from Saint Columb’s Rill, a tributary of the River Bush. It’s a popular place to visit, and you can take tours of the distillery, explore the shop, or just visit the licensed bar on site for a taste. We did the latter, sampling one of the aged single malts from the extensive selection they have on offer. If you want to take a tour, these are available on a first come first serve basis. If this is a must-see activity on your coastal road trip, we advise coming earlier in the day so you can be sure book a tour. Dunluce Castle is also owned by the MacDonnell family, who today own and live at the previously mentioned Glenarm Castle. However, it’s hard to imagine two more different castles that you can visit in Northern Ireland. Where Glenarm Castle is still inhabited today, and looks like a stately home, Dunluce is a splendid ruin, perched on the cliff top, and looking as if the sea might reclaim it at any moment. There has been a castle on this spot since the 13th century, but the present day ruin dates from around the 15th century, which was when it was at the height of its power. It commanded an impressive location, with excellent views along the coast and out to sea, making it a very defensible position. The MacDonnell clan lived here until 1690, at which point a lack of funds led to it falling into ruin, and it’s in this ruinous state that you can visit it today. It’s looked after by the Northern Irealand Environment Agency, and is a popular stop for visitors on the Causeway Coastal route. There’s a small fee to enter the site, and there is also a small information room and a discovery room to help you learn more about the castle before you head out to explore the ruins. 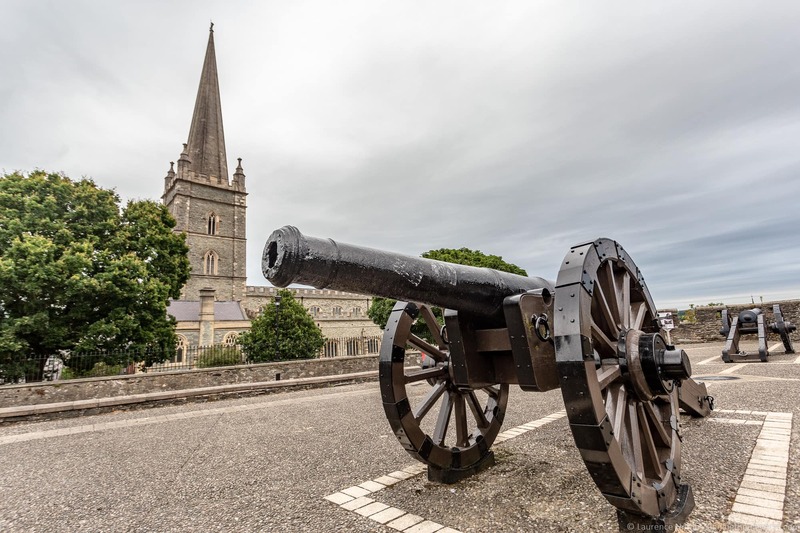 Our last stop on the Coastal Causeway Route, and also the end of the route, is the city of Londonderry, more commonly known as Derry. This would be the beginning of the route if you are driving the route eastward or coming from driving the Wild Atlantic Way. Derry is the second largest city in Northern Ireland, and sits close to the border with the Republic of Ireland. The city has a lot to offer, particularly its architecture, which it is well known for. It is also known for the history of conflict here, as well as the many murals about that conflict. The historic city centre is surrounded by massive walls, which you can walk along and get a great view of the old city center. Within the city center there are also a number of museums and other sites of interest to visit, as well as shops and restaurants of course. From Derry you can either end your trip and return to Belfast, or you could continue on along the Wild Atlantic Way, and turn this adventure into a truly epic road trip! We’ve put together a map of the Causeway Coastal Route that features all the highlights we’ve mentioned, as well as a suggested driving route. You can also see this map on Google Maps here. The Causeway Coastal Route is first and foremost a driving route, so our recommendation would certainly be to drive it if possible – perhaps as an addition to something like our two week UK itinerary. Alternatively, it can be done entirely standalone from Belfast – just pick up a hire car and head out. We recommend Enterprise and Priceline for finding the best deals on car hire, if you need options. If you would prefer not to drive though, you can do at least some of the Causeway Coastal route without a car, which we will explain below. In terms of public transport, depending on the time of year (May – September is best) you can get between many of the highlights of the Causeway Coastal Route by public transport. Just be aware that some of the locations on this map won’t have specific stops so you will need to do a bit of walking. It is definitely an option though – check out the Translink Rambler Service to see what is possible. The other popular option is to take a specific tour from Belfast or Dublin. There are a variety of tours of varying duration, here are some options to consider. Hopefully between these tours you should find something to suit your itinerary and budget! The Causeway Coastal route is around 200 miles in length, so in theory could be driven in well under a day of driving. Of course, to do so would be to miss many of the attractions and highlights, which is the point of the adventure. Our recommendation is to take at least two full days to do the route, stopping along the route somewhere to spend the night. If you only have 1 day and want to just see the main highlights, we’d recommend considering one of the tours from Dublin or Belfast that we mention above to get the most of your time. The first time we drove it, we drove most of the route in 1 day and just stopped at a couple main attractions. On our second visit, we did it the drive across three days, and saw everything on this list, including a few more attractions, and even managed to have a day and night on beautiful Rathlin island. 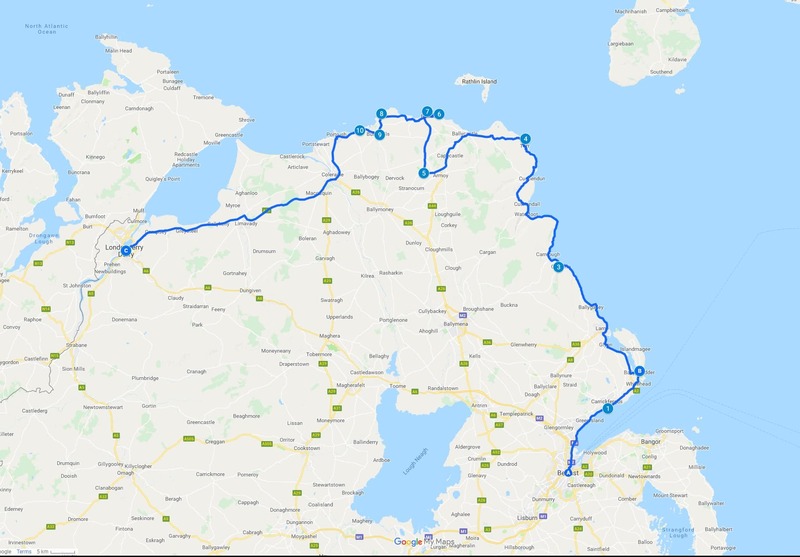 Our suggestion for the Causeway Coastal Route would be to spend one night in Belfast before you start, and then a night around the midway point, somewhere like Ballycastle, Bushmills or Ballintoy for example. Here are some suggested options to consider starting in Belfast and working around the coast. 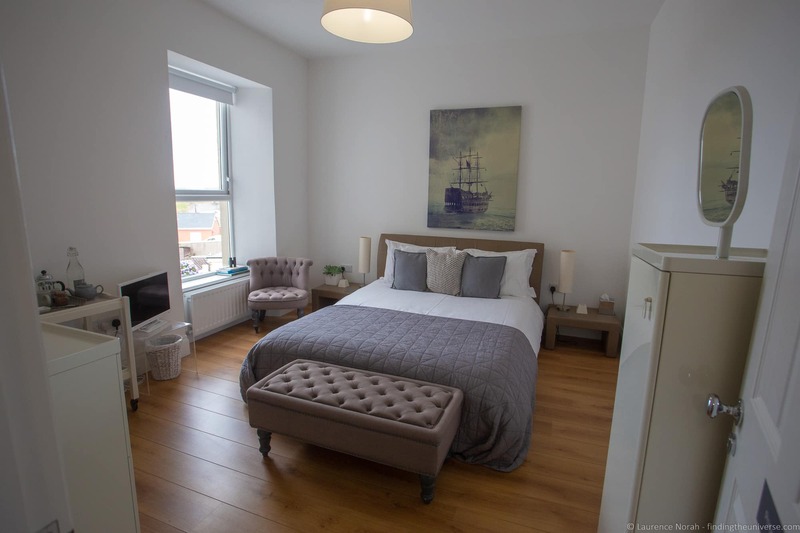 Bullitt Hotel – a very central Belfast hotel within walking distance of all the attractions with a good bar and restaurant. This was where we stayed in Belfast last time for 4 nights! Travelodge Belfast – a well located value hotel option with great reviews. Also take a look at the Ibis Belfast or the Hampton by Hilton Belfast for similar value options. Ballygally Castle – this was the first stop on our route, and if you are taking a bit longer to do the route this is a great option. Excellent dining on site as well as a Game of Thrones door! Blackrock House B&B, Portrush. A 5* luxury B&B in beautiful Portrush, this was where we stayed on our last night on the Causeway Coastal Route. We had an excellent breakfast here and our host was very friendly. As you can see from our photos, which were taken on our visit in August, the weather in Northern Ireland could best be described as changeable. We had everything from hot sunny days through to sideways rain during our visit, and this is something that can happen throughout the year. For the best chance of good weather, you’ll want to visit between May and September. Summer time will be the busiest time, so planning ahead will be necessary at this time of year to be sure any accommodation you want to stay at has availability. You’ll also want to plan your trip so any attractions with timed entries or limited tour capacity are at the start of your day. The route is driveable at any time of year of course, just be aware that in winter the weather has a higher chance of being worse. To help you plan for your visit to Northern Ireland, we wanted to share a few bits of useful information that you might find useful. Safety: Whilst Northern Ireland certainly has had its share of trouble in the past, we had no issues at all during our stay, and wouldn’t expect you to either. Just practice basic precautions as you would at home, keeping valuables out of site and locked away, and not going anywhere you don’t feel safe, and you will be fine. Power: Electricity is of the 220v standard, with the three pin plug that you’ll find across both Britain and the Republic of Ireland. Visitors from anywhere else, including other countries in Europe and the US will need an adapter, and US travellers in particular will need to check their equipment supports the 220v standard – it will be written clearly on the power adapter. Currency: Northern Ireland is part of Great Britain, so the British pound is the currency (the same as in England, Scotland, and Wales). You can get these from ATM’s, banks and currency exchanges, although credit cards are of course widely accepted. Note that if you travel to the Republic of Ireland that the currency switches to the Euro. Internet: Internet access is widely available in the form of WiFi at hotels and some tourist attractions. You can also pick up local SIM cards if you have an unlocked phone and want data as you go – this can be helpful for finding answers to questions and getting map information as you travel the route. Water: The water in the taps in Northern Ireland is perfectly safe to drink unless otherwise posted. Getting here and away: Belfast has a major airport with flights to many destinations across Europe. Dublin also has a major international airport with international flights available. From mainland Europe or the UK, you can also take the ferry and bring a vehicle. Check prices and book ferry tickets online here. We’ve spent time travelling in both Northern Ireland and the Republic of Ireland, as well as the UK, and have put together a number of guides to help you plan your trip. Here are some to get you started. A detailed 2 day itinerary for Belfast, to help you make the most of the city. We also have a guide to things to do in Belfast. And that’s it! 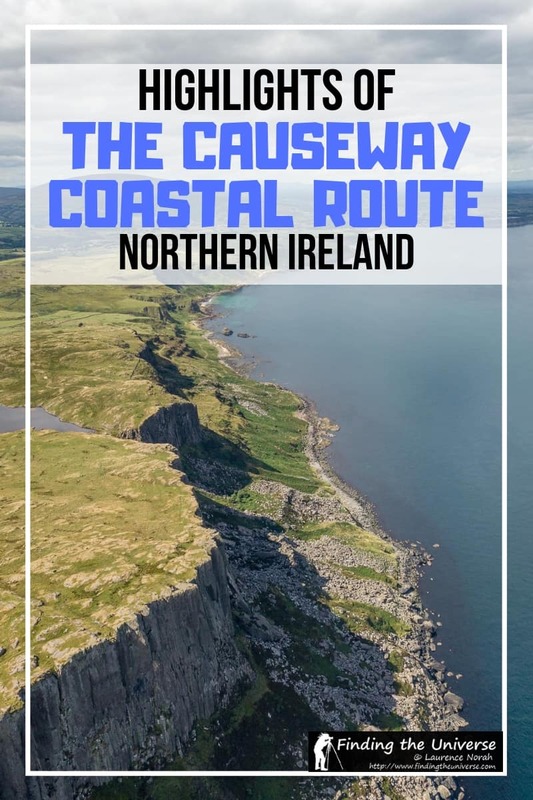 Hopefully our guide to the highlights of the Causeway Coastal Route has helped inspire your own adventure in this beautiful part of the world. As always, if you have any questions or feedback, let us know in the comments below! So you know: Our accommodation in Northern Ireland was covered by Discover Northern Ireland, who invited us to experience the country and write about it. 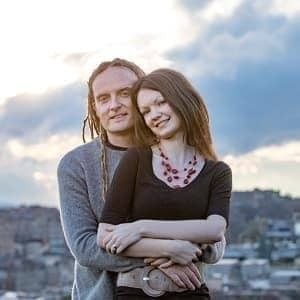 We covered our own meals and other expenses, including transport and attraction entry, and as always, only share our honest opinions and advice. See our code of ethics for more on how we work with brands and destinations. This is really a great website. Going to Ireland in 6 weeks and this is really helping with my planning. Very good job and thanks! Thanks for the review of Northern Ireland. We are considering a visit but my daughter is un a motorized wheelchair and we are concerned about accessibility to many of the sights. Can you advise as to how accessible these sights are for wheelchairs? Any guidance would be greatly appreciated. So certainly some of the sights will be accessible, and some not so much. I’ve gone through each of them and made some notes, but I would certainly advise also contacting any that you are specifically interested in visiting to confirm with them. I’d also check the websites of each attraction for more information. The Gobbins is definitely not wheelchair accessible, it’s a steep coastal path that hugs the cliff edge and has many steps and steep sections. It’s a steep slope up the hill to the top of the head itself, but there are still nice views from the car parking area. This is just a road, so this should be fully accessible! The harbour itself is accessible as far as I recall, the car park is right next to the harbor. From their website “The tour is a walking tour, involving climbing stairs and is therefore not suitable for wheelchair users or anyone with a walking difficulty.” So whilst you could visit parts of the distillery like the gift shop, I don’t believe the full tour is accessible. According to the website for the castle, there is limited disabled access for wheelchair users. As I recall most of the grounds were fairly accessible, just some parts of the castle ruin had steps. But I think you would be able to see most of it. This is a whole city so it will vary. For the walls for example I’m not sure if there is accessible entry, but it’s possible.